The Celebrate Recovery Devotional is 366 original brief readings, designed as a daily reinforcement and encouragement for millions who are on the road to recovery. Celebrate Recovery is not just a program but a means toward lasting life change, and the key to recovery is to keep the eight Christ-centered Life Principles alive. As readers engage with the devotions, they will discover the principles more firmly cemented in their daily thinking and actions, and will find ongoing support and hope for the road ahead. Each powerful devotion is a reminder of God's goodness, grace, and redemption, and will be an inspiration to anyone struggling with old hurts, habits, and hang-ups. Start where you are. Begin today. The Celebrate Recovery Daily Devotional is 366 original brief readings, designed as a daily reinforcement and encouragement for millions who are on the road to recovery. Celebrate Recovery is not just a program but a means toward lasting life change, and the key to recovery is to keep the eight Christ-centered Life Principles alive. As readers engage with the devotions, they will discover the principles more firmly cemented in their daily thinking and actions, and will find ongoing support and hope for the road ahead. Each powerful devotion is a reminder of God's goodness, grace, and redemption, and will be an inspiration to anyone struggling with old hurts, habits, and hang-ups. Start where you are. Begin today. 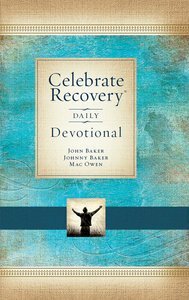 About "Celebrate Recovery Daily Devotional (Celebrate Recovery Series)"